I recently did a photography tour with Christine to Tasmania, it was thoughtfully and carefully planned and researched to give her students as much tutorial as they wanted or needed and also was full of enjoyment. We went in early January specifically so that we could see the lavender in full bloom which didn’t disappoint. There were a few early mornings for sunrise shooting at fabulous places, once again well researched, and it helped enormously that we also had great weather, particularly at Cradle Mountain. If you are considering doing one of Christine’s photography tours I have no hesitation in recommended you do it, you will thoroughly enjoy it. 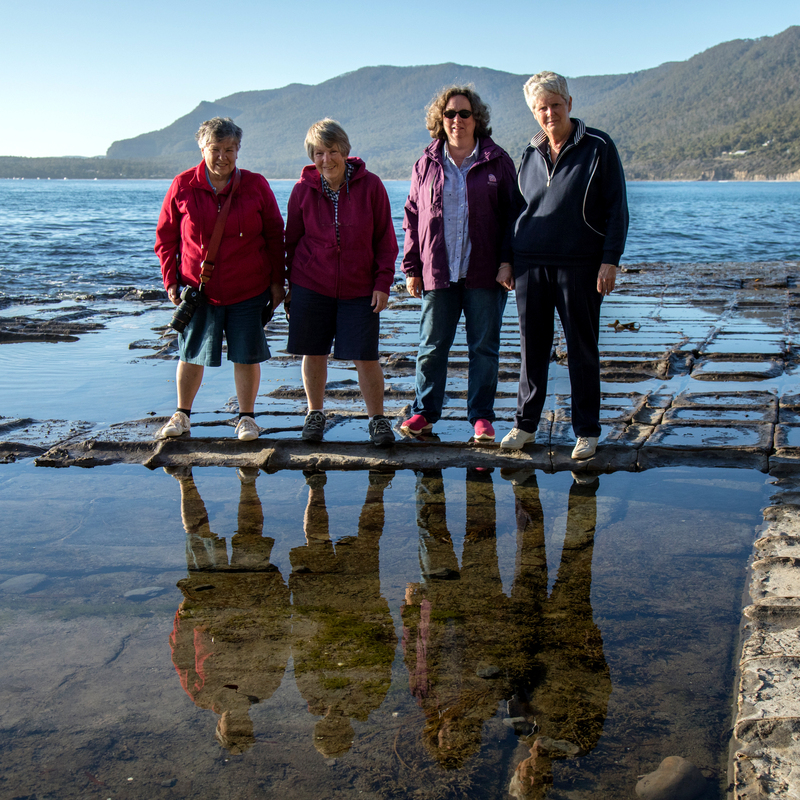 Chris designed a fabulous itinerary that made the most of Tasmania’s natural beauty and history. With excellent photography tuition for any level, Chris is a very kind, engaging and solicitous host. I learned so much in a very supportive environment. Thank you Chris for helping me be a better photographer. The itinerary was fabulous, accommodation great and the food fantastic. Best of all, it was fun! I recently went on a photography tour to Tasmania with Christine from Click Walk Learn Photography Tours. The tour was well organised, tuition was always available and given readily, places visited were photographically relevant and interesting, in fact every details from accommodation, meals etc. was taken care of. Christine is a very personable and fun lady and being in her company was a pleasure. As well as improving my photography skills I enjoyed the tourist side as well. From my experience of many day trips with Christine to the Tasmanian experience I would thoroughly recommend her photography tours. Thank you Christine for getting me out and about, being more creative with my photography – I feel so much more confident with my camera now knowing it’s features – somewhere along the way I feel like the penny dropped – goodbye auto and looking forward to the next workshop. I had a fantastic learning experience at the Click Walk Learn with Christine at the Rocks on 7 May 2016. It was a small group of three and Christine gave each of us individual attention. She knew a great deal about photography basics and advanced techniques as well as about all the buttons on our personal cameras. Christine offered a lot of information, great tips and critique on the spot as we were walking and taking our photos. She is very encouraging, easy to understand and inspirational. I would highly recommend Click Walk Learn tours to anyone. I had high hopes for this tour and they were met in every sense. It was a magical night I will remember for a long time. I found Christine’s explanations and suggestions spot on and her personality ideal for this type of event. I certainly look forward to attending more click walk learn tours. Thank you again for a great night. I had a great trip to the Blue Mountains with ClickWalkLearn. Amazing how much I saw and learned. Great group of people, excellent organization / itinerary, and tons of knowledge and extras. Great lunch too! Highly recommend! Thank you very much for your newsletter ‘PHOTOGRAPHY TALK’. I really think that you have to publish a book. You always advise strait to the point, very clear and easy to understand, and your diagrams are a masterpiece. Every one will remember them forever. Most of the books that have been written by professional photographers age too lengthy, boring and difficult to comprehend by someone with limited experience. Your little instructions are totally opposite, clear, short and very helpful. Had a fantastic tour with Christine on the Macro, Landscape & Architecture tour last Saturday. Learned lots about the various techniques of photographing waterfalls, buildings and flowers. Chris makes it a fun experience which seems to make the learning easier. I have done several tours with Chris and enjoyed the experience each time and have no hesitation in recommending click walk learn to anyone who has an interest in photography. On a recent short stay in Sydney I decided to join a click walk learn photography tour. I thoroughly enjoyed the experience, being a novice photographer, Christine’s helpful guidance and considerable knowledge gave me a better understanding of the working’s of my camera and photography in general. Christine’s advice on photo composition was invaluable and her helpful tips and mentoring enabled me to take some fantastic photos not only on the tour but for the remainder of my time in Sydney. I would certainly recommend anyone who has an interest in photography to join a click walk learn photography tour. I’ve just spent a magical morning on Coogee beach with Christine from Click Walk Learn. Christine is full of energy and enthusiasm about photography which is passed through to her students. This makes the morning not only informative but fun as well. At the end of the day you’ll walk away with some new amazing skills which will reflect in the photos you have taken. I went on Christine’s Night Photography course, and found it an invaluable experience. A very small group size meant that Christine gave lots of attention to everyone, really spending the time to make sure everybody understood what she was teaching. The obvious time she puts into prep also, having your camera’s manual on hand, for example, really shows. Christine’s passion for photography is delightfully infectious, and I finished the night full of new ideas and techniques. I would wholeheartedly recommend Christine’s tours to anybody wanting to learn some technique, while visiting some of Sydney’s most iconic photo locations. I will absolutely be booking another of her courses when I’m next in Sydney. What a great tour and fun way to learn. Christine was able to apply a hands on approach to learning, teaching my daughter and I how to take a great photo and equally importantly, how to use our camera’s. We had no idea we could learn so much in such a short space of time. Christine is so knowledgeable and best of all, patient and willing to impart her skills. She not only is a gifted photographer but a gifted teacher as well. My daughter and I feel like we have known her for years. We would highly recommend this tour to anyone holidaying in Sydney and wanting to make the most of capturing the beauty of this city. Thank you Christine, it was worth every cent and more. I had a great learning experience (and adventure) with Christine on the recent photography tour of The Rocks. She has an amazing ability to teach the basics of photography in the first few minutes of the tour. She adds to your knowledge and skill, step-by-step–immediately building on your experience. Christine was able to quickly establish a warm and safe learning environment on the historic streets of Sydney. Her passion for photography and empathy as a teacher were a magnetic combination. Hands-on experience is an important way of learning and is the core of her teaching philosophy. She made learning fun. She gave me a tour of my own camera. I learned how to use my camera in a variety of different conditions using a variety of settings. My photography skills and confidence improved immediately. Christine was able to cover basic and more advanced skills in the same afternoon. I also learned from the others in the class. I left the tour with great photos, new friends, and wonderful memories of a historic district in Sydney. I recommend this tour and this learning method to both basic and advanced photographers who want to learn more about the city and about the creative side to photography. I participated in my first walking tour with Click.Walk.Learn last weekend. I was relatively experienced in regards to my camera operation compared to some others in the group. Christine’s ability to explain the basics to those who needed help was impressive. She was clear, precise, easy to understand and extremely helpful and even though I perhaps didn’t need to know the basics I still found her advice valuable. Her knowledge of the 4 different cameras in the group was of a professional standard. I would very much recommend Click.Walk.Learn for anyone who loves to take photos, regardless of your skill level – you WILL come away having learnt so much and will have had a great time in the process. I had such a great day on Saturday at The Rocks Click Walk Learn Photography Tour with Christine Bernasconi. I had no idea of the capabilities of my camera and just how creative you can get with photography until Chris taught us some really cool photography skills and techniques. It was really great having the day to talk about photography, learn different things and then put this theory into practice by taking different shots around the beautiful Rocks. The manual accompanying the tour was really comprehensive and is a really good resource to have to go back and look at after the tour. I have really enjoyed looking through my photos from the tour. I am quite proud of them! I recommend Click Walk Learn Photography Tours to anyone who wants to have a great, relaxed day out learning about photography techniques that will enhance the quality of your photographs from then on. Christine’s passion for teaching photography was evident from my first conversation with her and remained through the critiquing of my photographs after the tour. My photography skills, photo composition and comfort for shooting out of “automatic” mode improved and to my surprise, I discovered a greater interest for shooting in black and white! An unexpected bonus of my click.walk.learn tour was being introduced to a new place, Cockatoo Island, which I plan to return to for more snaps and exploration. Auto mode is exactly what Christine Bernasconi of Click, Walk Learn Photography Tours promised I will never use again! With a 30 minute run through of how to set the camera to Aperture Priority mode we were off and away around picturesque Cockatoo Island in Sydney Harbour with Christine pointing out potential shoots with gentle guidance on what might make the shot a winner. Aperture, depth of field, exposure compensation, even black and white – it was all informative and understandable. And what I loved was that the tour wasn’t rigid, if I saw something off to the side I could just wander away and experiment before finding my way back to the group. Christine also knows her cameras and was very patient when explaining something that took my head a while to get around. A week later I had my critique back with very encouraging words and further advice on what I could try with the shot again in the future. Also I found friends and family who have liked my photos from the past, LOVED the photos from this tour. So if you want to simply and easily learn how to get off Auto Mode all the while exploring some great locations and taking amazing shots then I can’t recommend Click Walk Learn Photograph Tours with Christine Bernasconi enough. And Christine was right, I will never use Auto Mode again! I went from zero to hero photographer in just a few hours. It was amazing that you had time to individually critique so many photos both on the tour and afterwards. The mix of theoretical and practical and the feedback was the perfect combination to learn a lot about photography in a very short amount of time. You also helped my creativity by pointing out angles I wouldn’t have thought of or tweaks to photos. Just to top things off, the course notes are easy to read and understand and an excellent reference and we had a delightful coffee and cake stop just when we were getting a bit tired. For all walks of life this experience will be most enjoyable, guaranteed to walk away feeling confident and empowered as a photographer. click.walk.learn was a great experience. Christine explained the technical principals of photography in a very digestible way for newbies that she should write a book on it! I genuinely recommend anyone who wants to learn to shoot manual (and never again do auto) whilst having great fun and exploring places in a different way – to do this Photography Tour. I’d always approached taking photos with apprehension because I know I’m not good at it. My photos are always too blurry, with red eyes or just set awkwardly with composition. Thanks to Click.Walk.Learn tours and Christine’s encouraging advice I now have the confidence to use my automatic point and shoot camera and take expert shots. However I’d like to take it further now and get a DSLR. I recommend her tours because they’re fun, one-on-one and you’ll be surprised at how good you really are behind the lens. The Click.Walk.Learn tours are an experience not to be missed. Not only do you get a chance to “drive” your camera properly with the expert advice of a professional photographer, you also get to slow down and take in this wonderful city of ours and see things from a new perspective. I can recommend to even the most novice photographers that it will be an experience not easily forgotten! Click.walk.learn photography tours with Christine is a truly wonderful experience. I have done 2 of Christine’s tours. The 1st at Cockatoo Island with only auto mode experience. In no time I was taking shots using various settings with different lighting. I came away so excited that a couple of months later I did the Rocks tour. Christine you’re wonderful, I would recommend you take a tour with click.walk.learn, you will be surprised at how great your day will be. I learnt more in the first 5 minutes with Christine than I had in 6 months of playing with my new camera. She is such a wonderful and encouraging teacher, she has a relaxed style which put me instantly at ease. I love the way that she researches each model of camera on the tour, so that she can provide specific coaching help us get the best out of our own camera. Can’t wait to do her night course next ! Wow, what an amazing experience we had with Christine on the recent Cockatoo Island photography tour. She has an extensive, in-depth knowledge of everything you could possibly want to know about photography, from basics to advanced, which she teaches with passion in a very simplistic and hands-on way. My photography skills definitely improved after just a few hours of Christine’s very professional tutoring and expertise. We had lots of fun and laughs in this relaxed learning environment and we finished the day off with a glass of wine on the waters edge on the harbour, bliss !! Certainly a fabulous day to remember. We can’t wait to join you for The Rocks tour soon. I recently joined Christine on a Click, Walk and Learn tour as a complete novice photographer. Over the course of 4 hours I not only attained a firm grasp of the fundamental building blocks of photography but was also challenged to consider the more creative elements of composing shots. Christine is a knowledgeable and passionate teacher who made the afternoon a wonderful experience. I would recommend anyone, whether a novice or more experienced photographer to join Christine on any of her tours to help improve their skills. I look forward to joining Christine again when her night time courses are up and running. Christine was well planned for the photographic tour having downloaded each participant’s individual camera manual to her iPad for reference. Participants were never left wondering, “But how do I do that on my camera?”. Christine was extremely personable and ensured that each participant was afforded individual time at their own level throughout the tour. Christine’s personal work is of an extremely high standard and she is always willing to offer continued support and encouragement to her clients. I have strongly recommended Christine Bernasconi Photography and Click, Walk, Learn Photography Tours to friends interested in photography. The passion, knowledge, relaxed approached and the encouragement to take photos a different way, was so outstanding and so easy to absorb. I had a remarkable time and certainly will be doing further tours with Christine, as she has so much to teach and share.